This article originally appeared in The Globe and Mail on August 26, 2017 as part of a series on Walls, Bridges and Homes – a response to the emerging global appetite for a progressive narrative around inclusion and immigration. The series frames the thematic focus of 6 Degrees Citizen Space (Sept. 25-27), presented by the Institute for Canadian Citizenship. We seem to be desperate today to build bridges or to blow them up. The wall or no-wall argument, the barbed-wire fences now cutting up Europe are just new versions of the old idea that wherever water flows, people can be separated. Wars are still fought from riverbank to riverbank, as they have been for thousands of years. People still glower at or cower from each other across these theoretically uncrossable divides. Borders still follow rivers or mountains or ocean coasts, unless they were drawn in straight lines on a map by rival imperial officials – lines designed to show not their belief in diversity, but their indifference to complexity in colonial lands. We have this odd idea that borders are natural divisions – an idea fixed in our imaginations because so much of modern Europe was built on that myth. War after war after war leading from the Westphalian treaties in 1648 to the modern Westphalian nation-states. One way or another, these wars were aimed at creating what I call the monolithic model. Wars, rivers and mountains or arbitrarily drawn lines shaping nations which claim to house a single people. And the only way you can get to that notion of a single people is by pretending that they are made up of a single race, a monolithic religious belief system and total agreement on a shared mythology. The heart of racism lies in this idea of exclusivity. The rise of Western forms of nationalism – which have always been as much about exclusion as inclusion – also belong to this model of national, or even sacred borders separating people. For their own good. Because they are not meant to be together or mixed. It is amazing how many nation-states, which claim to be secular, define their borders in this deeply religious way. And no matter how much any monolithically conceived nation-state tries to present itself as a nice and pleasant place to live, it has to go on struggling with the reality that it was built on the imaginary model of racial and civilizational clarity. In order to achieve this delusion, selected languages, religions and religious texts have had to be banned. Minorities have been subjected to limited rights, expelled or slaughtered. Or they have had to deny their differences and metaphysically buy into being something they are not. So, the world of rivers without bridges, or with carefully – politically – negotiated bridges, has asserted irreconcilable differences across borders, while maintaining that there cannot be fundamental differences inside borders. For those who believe that we can do better, the building of bridges has become the symbol of hope, of improved human relations. Bridges bring people together. But so long as the old idea of borders constituting natural divides remains in place, these bridges of good intent – physical and metaphysical – are just targets waiting to be blown up by a cynical leader or a panicked mob, or a combination of the two, during a crisis. This was the story of Yugoslav writer Ivo Andric’s great novel, The Bridge on the Drina. The West has by no means been alone in this monolithic approach. Think of the dominance of the Hans and their mistreatment of the Uyghur minority in China; or the Burman majority in Myanmar and their persecution of the Rohingya people. But the global power and detailed influence of the European and U.S. late-19th-century empires – on everything from table manners to race – was unprecedented. They spread the Westphalian model all over the world. Canada’s betrayal of Indigenous peoples, the Chinese head tax, the Japanese internment, anti-Semitism, to take just four examples, were all part of that imperial inheritance – in our case, largely from Britain and a bit from France. And we took it up with enthusiasm. There was no historical or geographical excuse for this in Canada. The immigrants had treaties, agreements and relationships – family, social, military, political and economic – with Indigenous peoples going back three centuries. And all of that was built on the linkages of water. For thousands of years, right up through the colonial period, rivers and lakes had been what made human life possible, what joined people together. Rivers were the bridges of Canada, right up until the construction of the railways. We are one of the few places where most roads came afterward. The Canadian metaphor and reality was that of half a continent linked by water or ocean coasts. 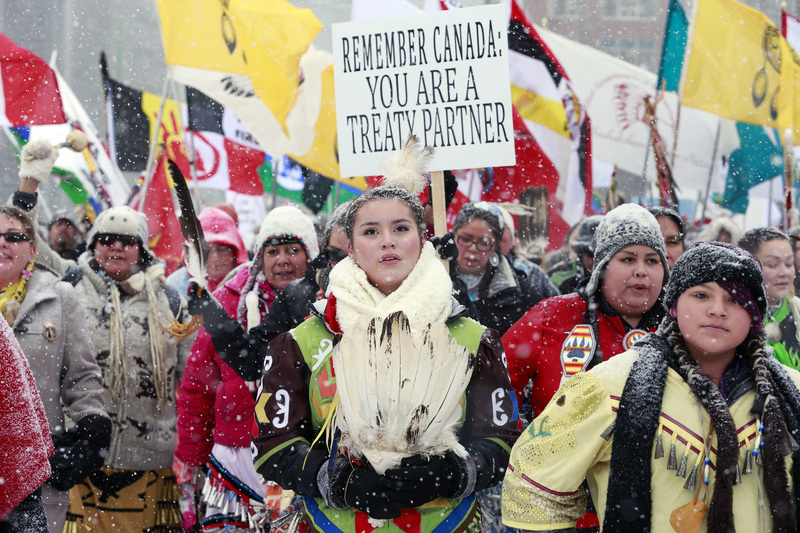 Most of the treaties invoked flowing water as a symbol of obligations on both sides, leading to permanent relationships between Indigenous peoples and immigrants. The guarantee of fairness and stability. Of course, the betrayal of these agreements came from the newcomers’ hunger for land and from political ambition. But beneath these lay the driving force of the European monolithic mythology: Nation-states could only be constructed by eliminating as much complexity as possible. Over the last 60 years the nations of Europe have built a project aimed at getting beyond their didactic idea of difference as a negative; of bridges as a threat. And just to be clear, the United Kingdom is still part of that Europe, and will be, whether Brexit happens or not. In the long run, politics cannot change geography or history, no matter how hard it tries. The Europeans had only partly freed themselves from this fear of their differences when the migrant crisis struck in 2015. Of course, it is not a “migrant” crisis. That is what Europeans have called it, as if to deflect what was really happening. And in the process, the old idea of borders, rivers, mountains, bridges, walls and fences as places to fear the other has been revived. The person on the other side! The person who may cross over. Much of this crisis is the result of a refusal to deal with immigration issues in a transparent and honest way, but also of bureaucratic heavy-handiness from European Union headquarters in Brussels, and political weakness in the various nation-states. Many people are now relieved by the outcome of a few elections which suggested that the crisis was at last on pause. But it isn’t. Nothing fundamental has changed. The ugliness left over from the old monolithic model is still hard at work across most of Europe, to say nothing of the United States, Australia, the Philippines, the Middle East, North Africa. The list goes on. If fundamentals don’t change, it’s only a matter of time before there is new disorder, because Europe remains strangely unconscious about its immigration reality. Since the last World War, Western Europe has been a centre of immigration. Seventy years. Millions of humans – displaced people, cheap labourers from the empires, then from the ex-empires, their families, refugees – have come and stayed. The whole of Europe slowly became a place of bridges, for both honourable and dishonourable reasons. Yet, none of this led to formal immigration and citizenship policies at either the European or the national levels. All of this has happened as if the immigrants were just passing through. That’s why the most common term used is migrants and not immigrants. Nevertheless, out of this confusion and denial, remarkable changes have already come. Terrorist attacks distract us from the social and economic energy which this immigration has brought. But there is still no country in Europe with what could be called a conscious and intentional immigration policy or an immigration-and-citizenship department, or an appropriate body of professional civil servants to handle what is happening anyway. All of this still comes under national ministries of the interior – the law-and-order departments. This cannot help but shape the attitudes of European governance. The embassies of these countries do not have large immigration sections. In a way, those risking their lives to cross the Mediterranean have no dignified alternative. No other way to apply. Bit by bit, citizenship systems are being clarified and civil servants are being hired. Public ceremonies now exist in a few countries. Those ceremonies are important because they can transform new kinds of belonging into a public celebration. But it is all happening too slowly. At the very least, countries such as Germany, Britain and France could set an example by creating large government departments entirely focused on the complexities of immigration, refugee crises and citizenship. They need to separate this reality from the important but different forces driving their ministries of the interior. There is one other important and positive development – grassroots volunteer organizations that work with newcomers have been growing at a speed which is both remarkable and moving. And I do mean grassroots. It is often small groups of citizens in little German towns or French villages or on Greek islands, who are showing the way. To the extent that the Canadian system works, it is on one side thanks to a policy, a department, an expert civil service; and on the other side to tens of thousands of engaged citizens, many of them involved in volunteer organizations. Without one half or the other, the whole system would collapse. Our system has given itself one important psychological advantage – a clear understanding that the primary purpose of immigration is to become a citizen, as fast as possible. The sooner immigrants are citizens, the sooner they can help carry the burden of making society function. Yet, no matter how successful the Canadian system, it cannot work in the long run if it – we – function in denial of reality. For half a millennium, immigration to Canada has been intimately tied to the Indigenous peoples. They welcomed newcomers for hundreds of years. Their welcome and openness, their support and sharing, shaped what our immigration policy would come to look like at its best. They were betrayed, particularly from the 1860s on. That is why there is growing debate over how to handle the role of historic Canadian leaders in this wrongdoing. One thing is clear, after a long struggle: Indigenous peoples are on their way back to a position of great influence. We all agree that our system of immigration and citizenship is not perfect. I would argue that its fragility lies in our denial of the central role of Indigenous peoples. That is the original Canadian conversation – between those who were here and those who came. Deep within our reality, it is still the essential Canadian conversation. To deny this is to deny our history, but also our structures of injustice. We now all know that the bricks and mortar of that injustice is underfunded and below-standard schooling, a dearth of Indigenous-language programs, social programs, medical services, clean drinking water, housing. And much more. We know changes are coming. But too slowly. We know that evil was done through state schools, the public administration system, policing and the courts. And all of this was enabled by our parliament and provincial legislatures. Apologies have been made. But apologies are neither actions, nor money, nor programs. We talk endlessly about reconciliation. But reconciliation is nothing without restitution. All these elements represent the as-yet unbuilt bridges necessary for respectful human relationships. Some Indigenous people do not see themselves as Canadians. Some do. Some see themselves as both Indigenous and Canadian. That is their business. And that is a reminder of how clearly we must reject the Westphalian model, its monolithic mythologies and its 19th-century pastiche imitations of what makes a proper nation-state. So when we talk about diversity or multiculturalism or interculturalism we are talking about an important philosophical difference with standard Western ideas of how societies function. These are not just words or conveniences. They are ideas which can reshape human relationships. That is why the concept of rivers as the bridges of this place is so important. It is a very different idea of human relationships, which is not based on fear of the other or on the exclusive ideas of difference, or on equally exclusive ideas of oneness. All of this is carefully laid out in Indigenous philosophies, which embrace complexity as central to how human beings embrace their differences and their relationships with each other. This involves concepts of how humans relate to place, concepts that take us off our controlling pedestal and make us part of the place, with responsibilities rather than ownership as the key factor. Richard Atleo. Read Leroy Little Bear. Read Jean Teillet. Read Taiaiake Alfred. Read Lee Maracle. Read Niigaan Sinclair. Read dozens of other Indigenous thinkers. You will see what I mean. More important, you will see what they mean. I have written before that the only roots I can find for the degree of comfort in our attitudes toward immigration and diversity are Indigenous. We owe a debt of gratitude for this. And for our comfort with complexity we owe a deep debt of gratitude, in particular to the example set by the Métis Nation and its people. They demonstrated that, with complexity, you can build a civilization. It is curious. Most of us will agree that great evil has been done; that our apologies were right and necessary. Most of us will agree that the resulting injustices must be faced and dealt with, whatever the cost. More and more we understand that our governments must stop fighting in the courts against justice for Indigenous peoples. And that treaty negotiations must be dealt with expeditiously, and not as if our negotiators were divorce lawyers. But it doesn’t seem to occur to us that when you owe a great debt of gratitude, one of the first things you do is show respect by saying thank you. That is how bridges begin to be built. John Ralston Saul is the author of The Comeback and The Collapse of Globalism, president emeritus of PEN International and co-chair of the Institute for Canadian Citizenship.